Vendio's top-rated Image Hosting service employs multiple redundancy to ensure maximum uptime for images. You simply cannot sell products without images - in fact, a good quality image is the most important element in a product listing. Displaying relevant, good quality photos in a product listing will boost views and exposure, and will result in significantly higher conversion rates. You can rely on Vendio Image Hosting to display your images from listing start to close, without interruption. With Vendio's bulk uploading and import features, images can be added to inventory quickly and easily. Use our ZoomStream image format to showcase items that require large high-resolution images without impacting page load speed, and Watermarking to protect your valuable image assets. Bulk Upload: Multiple bulk upload options provide an easy way to import and organize your images. Reliable hosting: Redundant system provides the highest level of reliability. Image resizing: Resize images automatically, as you upload them. Auto-renew and auto-delete: Set your images to auto-renew or auto-delete based on your specific business needs. 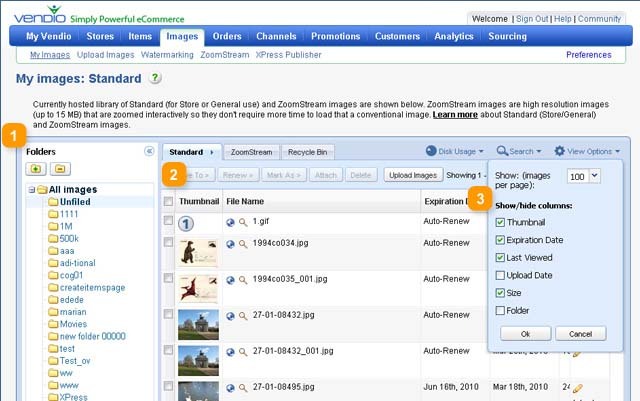 Optional enhancements: Protect images with Watermarking, and display large, high-resolution images with ZoomStream.